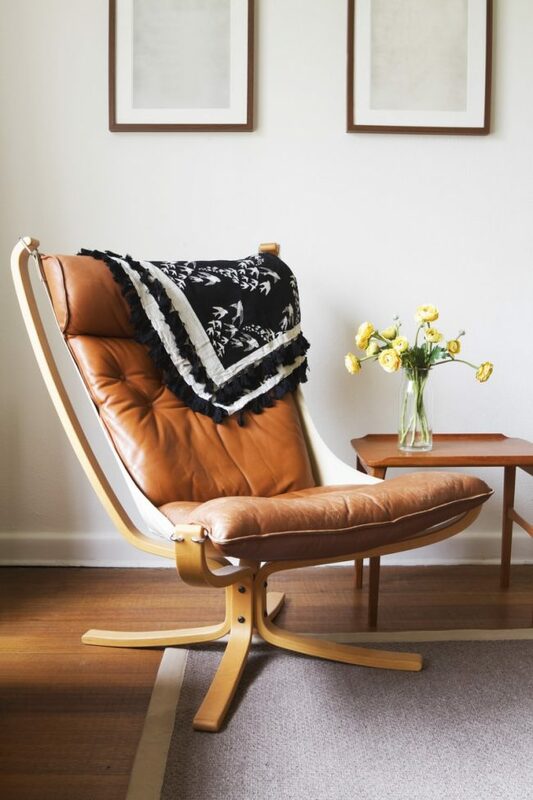 Decorating in the retro style can be a fun way to add some personality to your home. Retro interior design can refer to any decorating theme from the past, though it has a focus on the décor trends of the 1950s, 60s, and 70s. Any older than that and you might step into vintage territory, a style that can have some common themes with retro. Most people looking to incorporate retro style into their décor are probably attracted to this design trend because of its lively feel. This is not a gloomy or subdued decoration style as it’s characterized by wild patterns and bold elements. Simply hearing the word ‘retro’ can take you back to the 60s where the essence of this style concentrates. Pulling off the retro look requires a certain flair. This style may not be suitable to everyone’s tastes, but if you’re ready to transform your home in a funky and exciting way, then check out the following tips. When it comes to the color palette, the retro style has a very energizing scheme. Two of the most iconic retro shades are avocado green and mustard yellow. Various color combinations of brown and red fit in nicely. Retro fans can also incorporate black and white in more interesting ways. 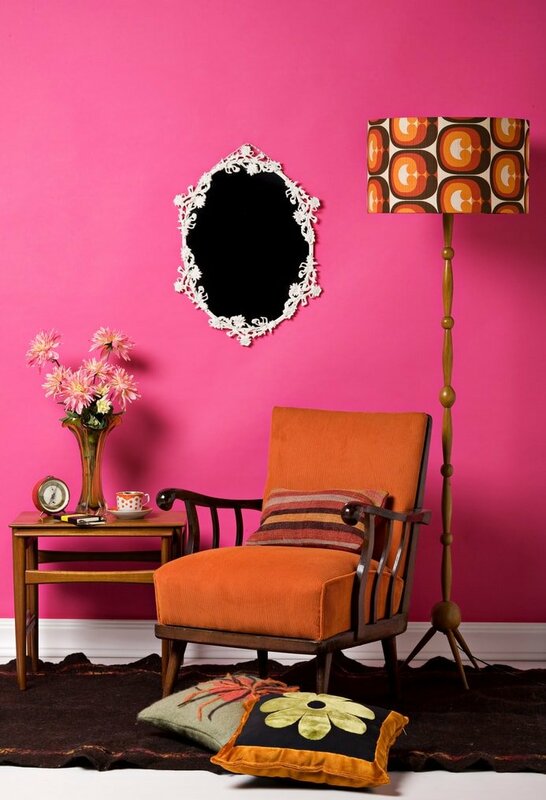 Bright colors such as hot pink and turquoise are a good match for any retro décor. You can also use more muted variations of bold colors and still maintain an authentic retro look if you wish to have a more subtle approach. Decorations in this style might sometimes use multiple tones at once in a single piece. Colors can make a bold statement through fabrics and coordinating textiles. It’s tempting to go wild and create a highly vibrant look, but you need to find some balance because throwing too many different shades around can create a scattered visual effect. 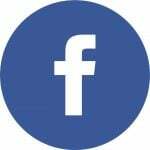 You should avoid that as it can make the room feel uninviting. One classic element of the retro era is represented by checkered patterns. Things that can be easily included in a retro room are complex paisley prints with large patterns. This style benefits a lot from incorporating vibrant patterns on the walls as murals or wallpapers. It’s understandable that not everyone will like to go all the way when it comes to retro patterns. Alternatively, you can only add some subtle hints of this style by using smaller prints and less flashy patterns. A good example is to incorporate some geometric repetitive patterns in smaller quantities to prevent them from becoming too overpowering. To tone down the bold retro styling you can also include more solid colors along the patterns. 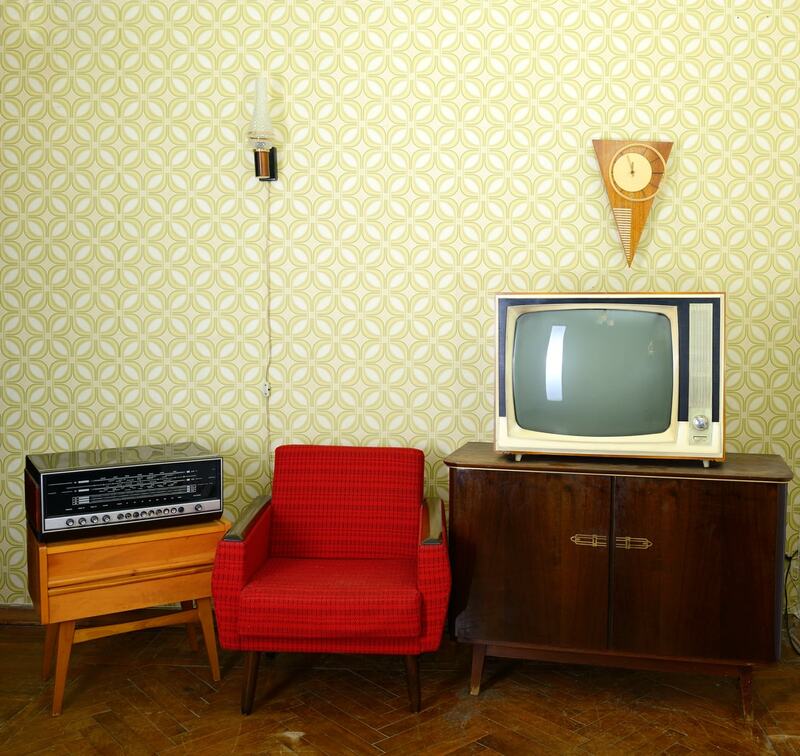 Kitschy patterns on the walls fit well this interior design trend when paired with other retro decor items. As opposed to other styles where the furniture doesn’t try to gain too much attention, the retro style favors pretty much the opposite. The pieces you choose should all strive to be as eye-catching as possible. Sofas need to be broad and decorated with multi-colored pillows while a retro home bar makes use of well-polished chrome barstools and hot pink textures. The furniture makes use of curvilinear and circular forms. Those are some of the trademarks of the retro style. 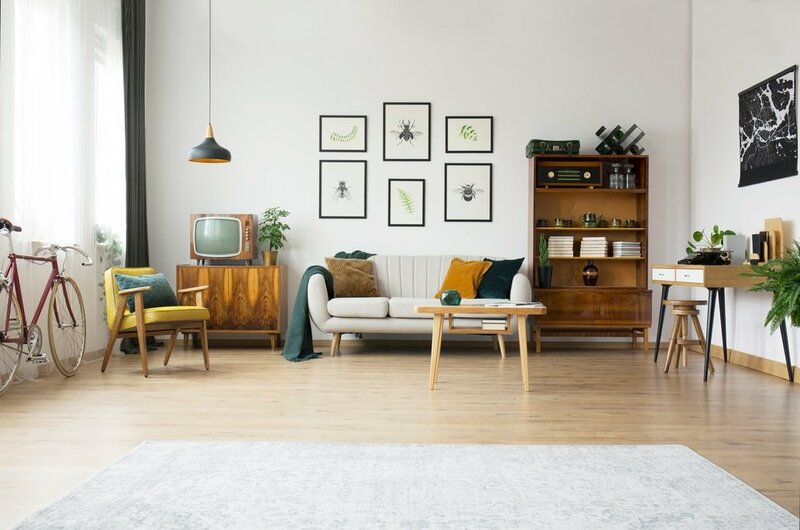 While you can try to keep a cohesive style in your home, adding some modern furniture alongside retro-styled pieces won’t hurt. In fact, you can create a more captivating look by adding some lacquer-finished furniture or some pieces with leather upholstery. 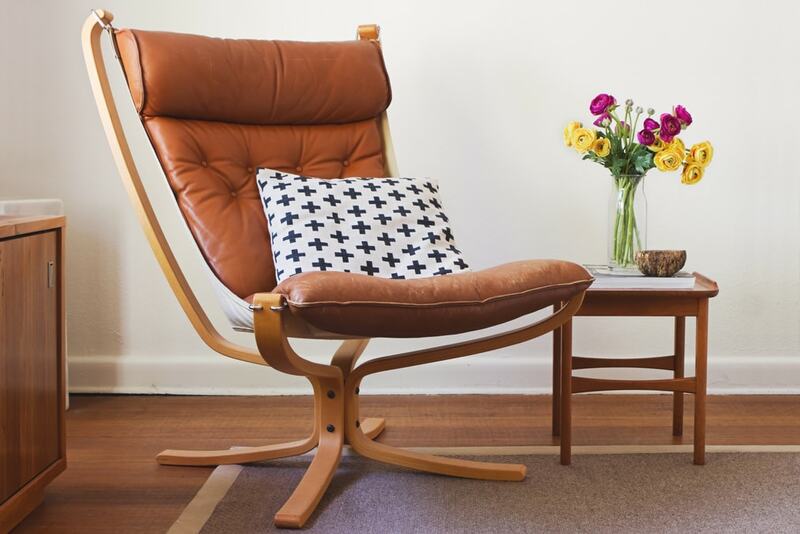 If you’re a minimalist at heart, you can still make use of a bit of retro flair when selecting furniture pieces. Go for simple lines and curves and limit the number of elements in the room to bring those high-quality pieces in full view. Intricate and detailed woodworking has no place in a retro home so try to make use of more fluid forms. Placing some bold accents represents a quick method to add some retro style to a room. Accessories play an important role when decorating in this style. Some good examples are lava lamps and skate tables. Abstract pieces of art are welcomed and the more unusual their look, the better the visual impact. Don’t just settle for boring landscapes and consider incorporating some sculptures as well. The choice of flooring can have a considerable impact when accenting with retro appeal. We’ve already mentioned checkered patterns and those would fit nicely for the floor. Natural wood works well when paired with shag carpeting. There are many textures that can add a solid effect to any retro interior. We especially like smooth plastics and soft vinyl. The lighting has some role for tying together the retro style look. Floor lamps are solid additions or you could try going for a bold chandelier that’s brightly colored and has a dangling cord. Similar to other retro elements, the lighting should be functional and seamlessly integrated with the rest of the décor. A key principle of the retro style is to unleash your creativity and lose your inhibitions. Bringing the retro charm to more items in your home is important if you want to get a harmonious look. Various appliances such as refrigerators or stovetops can have a large impact on completing the retro kitchen look. It’s important to select the right models, those appliances that feature the ideal shape, material, and color to suit the retro aesthetic. 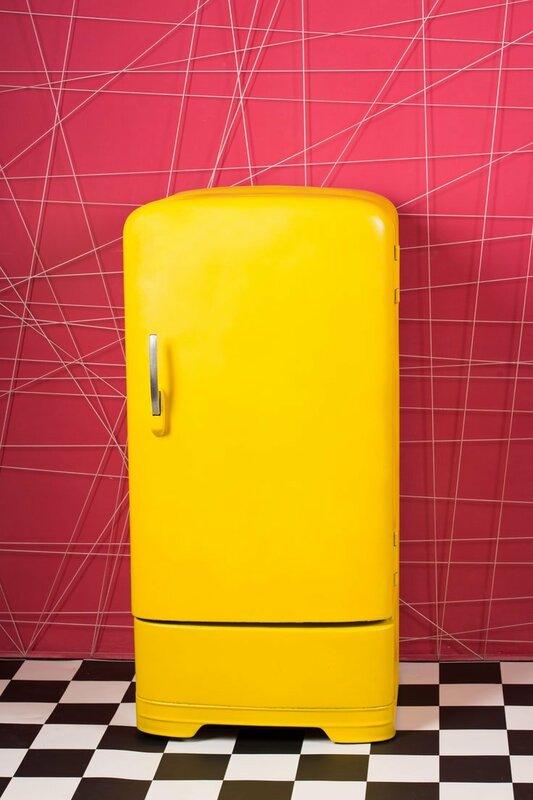 Take a look at the flashy design of this retro refrigerator from Daewoo found on Amazon. It’s a good example that embodies essential characteristics of the retro style such as rounded edges and striking colors. For the other appliances consider adding some more chrome in your life as this is a classic material used in the retro style. Here are some small appliances from Amazon that pull off the retro look – cherry red microwave oven and chrome-accented toaster.